Which type of Marmoleum is best for your project? Marmoleum can be used in almost every room of a home or office, depending upon the subfloor, who will install it and what colors you like. Styles--Real, Vivace, Striato, Fresco, Walton, Graphic, Piano, Unexpected Nature, Concrete, Decible, (2.5mm x 79" wide cut to any length up to 105') or MCS (2.0mm x 79" cut to any length up to 105'). All are glued down with Forbo Sustain 885 adhesive. Styles--Modular, (2.5mm thick in 10"x10", 10"x20", or 20"x20") or MCT style (2.0mm in 13"x13"). Both are glued down with Forbo Sustain 885 adhesive. Styles-Planks--36" long x 12"wide or squares 12"x12". All are 3/8" thick made with a 3 ply sandwich of 2.5mm Marmoleum on the top layer, high density fiberboard middle layer and cork bottom layer. Which Marmoleum is best for you? Will the installation be in new construction or a remodel? What type of foot/paw traffic will there be? What color(s) do you like? 1) Subfloor: concrete or wood? 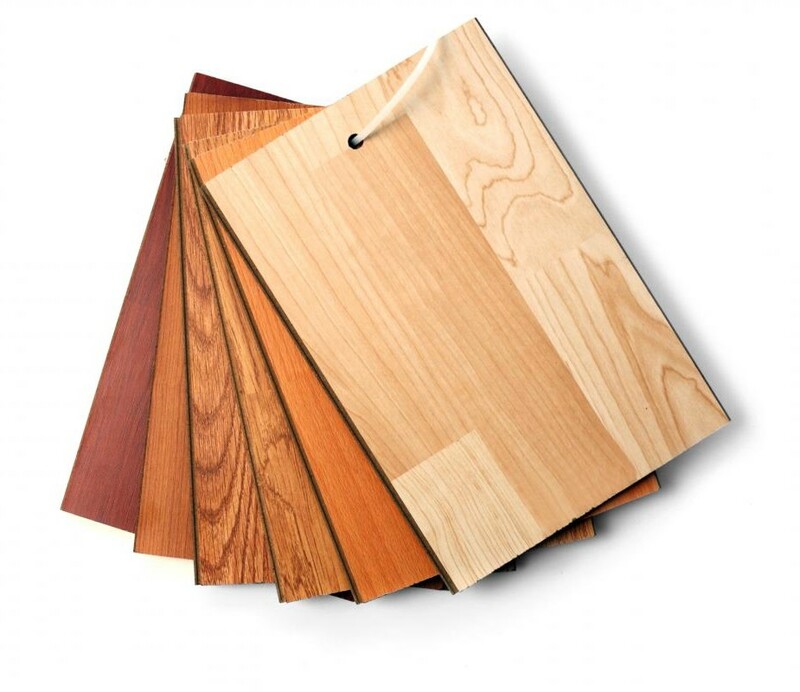 Subfloors are usually made of concrete or wood (plywood, OSB, chipboard). Proper installation requires that the subfloor be clean, dry, flat, smooth and free of dips and bumps. Cracks and sloping subfloors need to be filled and leveled; this can be costly, as it usually requires professional installation. 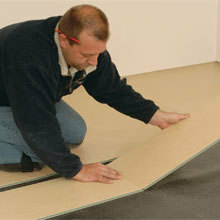 A plywood underlayment may also be needed on top of the subfloor. Note: Marmoleum sheet and tile cannot be glued directly to underlayment or subfloors made of luan, particleboard or chipboard because these materials expand and contract too much and are not stable. Tip: If you live in an apartment or condo with concrete subfloors, make sure that it's Portland cement (grey) concrete and not gypsum (white, lightweight) or Gypcrete. Special priming will need to be administered if it's gypsum-based. Marmoleum Click panels and squares are the only type that can tolerate slight unevenness in the subfloor, up to 3/16" over an 8' span. 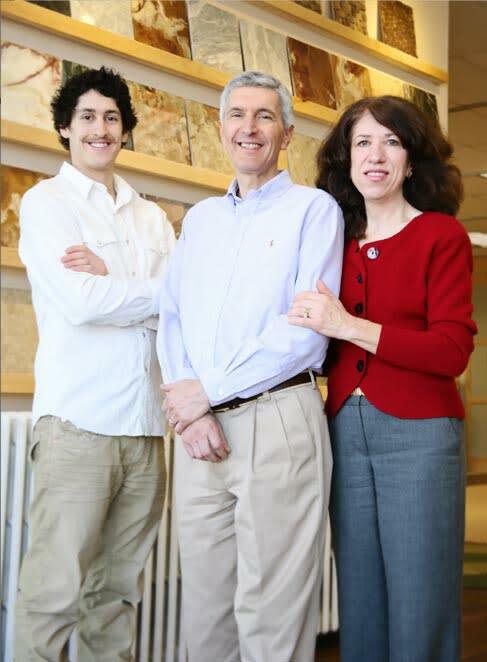 Larger variations in your subfloor will cause too much stress on the click mechanism and eventually wear it out. Click panels and squares can even be applied over most vinyl or ceramic tile. If you have asbestos tile, before installation please consult with professionals who provide asbestos abatement. 2) Installation: new construction or remodel? In older homes, click panels and squares are preferred because they're easier and faster to install than sheet or tile, and they require much less floor preparation. 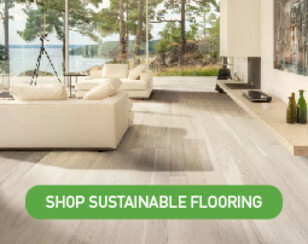 If you install the flooring directly over another floor such as vinyl, ceramic or hardwood, you can save time and money because there's no tear out required. This is possible with Marmoleum click because it requires no glue or nails, and it floats over the existing flooring or subflooring. Proper vapor barriers are required such as Moisture Block; however, old sheet vinyl can act as a vapor barrier. Installation of Marmoleum sheet or tile in an older home requires complete removal of the existing floor and usually some adjustment to the subfloor, as it has often settled or warped over time. Although the initial cost of the material may be less expensive than the click product, the preparation and installation costs could be far more. In new construction, any of the three products can be used as there's usually little or no prep work required. For DIY installations, the click products are the easiest, but Marmoleum tile can be a good option because it's easy to install piece-by-piece and there's little waste. They are certainly easier to install than the sheet goods. Tip: The use of Marmoleum sheet usually requires professional installation due to the seams which require special tools and lots of experience. If, however, the width of the room is less than 79", as in a small bathroom, there may be no seams, and sheet goods should be considered. Cutting Marmoleum is relatively easy and not too challenging in small rooms. However, unlike tile-which can be discarded if you make a bad cut-there can be no mistakes with sheet goods as one bad cut can ruin the entire piece. When you look at the costs of Marmoleum plus installation and maintenance, it can be less than cork, bamboo, hardwood and ceramic or vinyl tile. But, it all depends upon how much prep has to be done and who will do the installation and maintenance. Bear in mind, preparation costs can be substantial for sheet and tile because the subfloor needs to be perfectly flat. This is true of any nail down hardwood floor, ceramic tile or vinyl tile floor too. However, the click product is much easier and requires little or no floor prep. Many customers have found installation of click panels or squares over existing subfloors by themselves can save a great deal of money. However, if your subfloor is smooth and flat, and the dimensions of the room requires no seams, i.e. 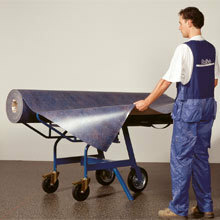 less than 79" wide, you can install Marmoleum sheet or tile by yourself. On the other hand, if you live in an older home that has severe settling and needs serious attention, you probably will need a professional no matter what type of floor you purchase. Tip: Be realistic about your skills. Installing Marmoleum tile or sheet goods can be done by most contractors, however, seaming and complex floor preparation usually requires professionals with experience in this type of flooring. While Marmoleum Click may be a DIY product, it still requires certain skills, tools and patience. We can help walk you through most of the installation process, but if you need floor preparation, it's best to consult with a professional. Like any long term investment, you have to consider the cost of upkeep. Forbo Marmoleum is designed to last a very long time. It has earned the nickname "40 year linoleum" and "battleship linoleum" for good reason-it holds up under abuse and is inexpensive to maintain and repair. For starters, all Marmoleum products come with TopShield2 built into the surface which is a protective sealer that makes cleaning dirt and scuff marks much easier. For those of you with dogs, cats or children, it's important to know that Marmoleum flooring, whether sheet, tile or click, will wear well. That's because it's a solid through-body product. Forbo does not claim that it will never be scratched, because it certainly can. But, it can be easily and inexpensively repaired and re-sealed creating a long-lasting finish unlike vinyl, laminate or ceramic tile, which can be scratched or cracked and not easily repaired. 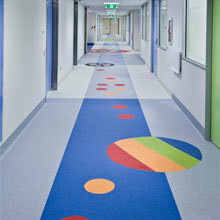 Some of the largest users of Marmoleum are schools and hospitals. 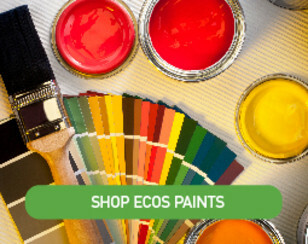 The primary reason is because it holds up to heavy foot and wheelchair traffic of all types, is colorful, completely non-toxic, anti-microbial, anti-static and repairable. Marmoleum has proven that it can handle moisture very well. Recently divers explored relics for the 100-year anniversary of the Titanic and discovered lots of Marmoleum flooring that was still intact in the cabins after being underwater for 100 years! You read that right. It has also proven that minor or major scratches can be buffed out with the right equipment. Making quick and easy repairs is far less expensive, time consuming and sustainable than sanding and refinishing the entire floor. Please see the Marmoleum maintenance guide for more details. Marmoleum sheet goods offer designers a huge palette of 150+ colors and textures. 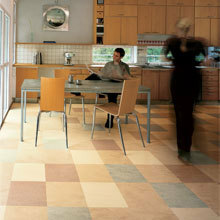 Marmoleum tile offers 60+ colors. Marmoleum Click offers 28 colors. One of the cool things about the sheet goods is that you can cut patterns into them or use predesigned water-jet borders to add some real uniqueness to your design. These require professional installation, but add a striking custom look. Marmoleum tiles, on the other hand, offer neat classic patterns and styles, without the high price tag. Marmoleum click panels and squares afford more modern themes with the least cost. Tip: One thing you'll notice about all Marmoleum colors are their matte finish. They seem to blend beautifully with one another and with your home. Don't be afraid to experiment. Be bold, because once installed on the floor, even the strongest colors don't appear that way on the floor. Marmoleum can also be used on countertops, desks, wall panels, bulletin boards, furniture and more. If you haven't been to a Taco Bell lately, check out the front desk and surrounding walls which are both covered with Marmoleum sheet and wall panels. Colors/Styles 9 design palettes, 183 beautiful colors. Smaller jobs don't require professional if there are no seams. Once you've chosen the color and style, please request a sample to review it in your home or office. 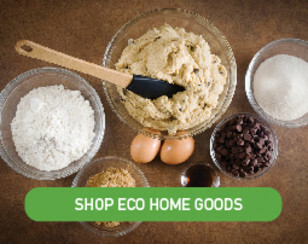 Samples are available on our website on the right hand margin below the add to cart button. If you need further assistance, please call 800-405-0222 or email [email protected].